The four Hana cartridges reviewed here (EL, EH, SL, SH) are designed and manufactured by Excel Sound Corporation of Japan. According to its website, this 45-year-old company has more than 50 years of cartridge-making experience, much of it OEM work for other companies. To protect its OEM partners, the company and its U.S. distributor, Musical Surrroundings, provided little information beyond the cartridges’ technical specifications. Although not the subject of this equipment report, an Internet search of available cartridge databases shows that Excel cartridges of the past very closely resemble some offerings of certain major brands. The nomenclature for the Hana (EL, EH, SL, SH) cartridges uses an “e” to signify elliptical stylus, an “s” to signify Shibata stylus, an “l” for low output, and an “h” for high output. The four models in the series are the Hana-EL (elliptical stylus/low output), Hana-EH (elliptical stylus/high output), Hana-SL (Shibata stylus/low output), and Hana-SH (Shibata stylus/high output). The biggest price differentiators for the Hana cartridges revolve around the choice of stylus: $475 for the elliptical stylus or $750 for the Shibata. Digging a bit further into the specifications shows that all four cartridges have cross-shaped armatures, aluminum cantilevers, a recommended tracking force of 2 grams, 70µm tracking ability, and a 5-gram total weight. The E series has >25dB channel separation, <2dB channel balance, and a frequency response of 15Hz–25kHz. The S series has tighter tolerances of >28dB channel separation, <1.5dB channel balance, and an extended frequency response of 15Hz–32kHz. The high-output versions have a coil impedance of 130 ohms at 1kHz and a recommended load impedance of 47k ohms. The low output versions have a coil impedance of 30 ohms at 1kHz and a recommended load impedance of >400 ohms. Evaluating a single cartridge can sometimes be a challenge. Evaluating four cartridges can trigger a cerebral hemorrhage. Fortunately, having some structure with setup (employing consistent routines for installation and adjustments) helps maintain focus. The particular set-up procedure used for these cartridges has been documented in the pages of TAS (Issue 244 and online at http://www.theabsolutesound.com/articles/setting-up-a-phono-cartridge-1/). 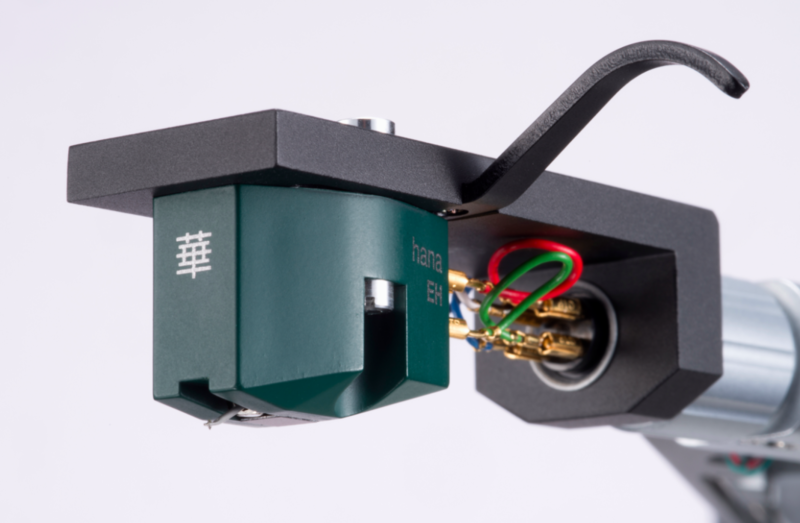 Multiplying this procedure for four cartridges on two different turntable/tonearm combinations, while also allowing for multiple hours of run-in time for each cartridge, gives some idea of the behind-the-scenes commitment involved in evaluating the Hana E and S series cartridges. Using four different phonostages (Ayre P-5xe, Musical Surroundings Phonomena II+, Lamm LP2 Deluxe, and a custom-designed and modified unit called The Raptor) allowed further isolation of cartridge performance characteristics from a specific phonostage. While it’s nearly impossible to parse cartridge performance without considering the associated components, some effort was made to account for those variables by using a variety of equipment. A general approach to cartridge setup resulted in measured performance meeting published electrical specifications. With some additional attention to setup, as per the procedures mentioned above, there was an improvement in measured performance, which correlated with listening results. One example of this was the azimuth setting. With a level headshell, the Hana cartridges (EH, EL, SH, SL) all met their minimum channel separation and channel balance specifications, which is a very good sign of quality control. Further refinements to azimuth in ’arms that allow these adjustments in most cases yielded improved measured performance for the Hanas. Singling out the Hana-SL cartridge, the baseline measurement in the Clearaudio Performance DC Wood with Satisfy Carbon Fiber ’arm resulted in a channel separation of 31.2dB (left) and 28.4dB (right) with channel balance remaining at 0.5dB when referenced to 1kHz. Electronically adjusting azimuth improved the measured results for channel separation to above 31dB in both (left) and (right) with a steady 0.5dB difference in channel balance, resulting in better subjective performance. Moving the Hana-SL to the Basis 2800 Vacuum ’table with Vector IV ’arm produced an impressive channel separation of 36.7dB (left) and 35.9dB (right) with channel balance remaining at 0.5dB. These are excellent numbers for any cartridge at any price. While measured performance by itself is no indication of exceptional personal engagement with music playback, there are some strong correlations that overlap in many cases. The key is carefully considering what to measure and what to listen for during fine adjustments, even after measurements are complete. Both are essential to long-term satisfaction in my opinion. The rubber hits the road, so to speak, when the listener is engaged with the music engraved in the grooves, and that satisfaction doesn’t come from a piece of measuring equipment—it’s what the ear collects and sends to the brain.